Watch the video: From animal bones to high-end artifacts, see what's being unearthed at a famous site in Chicago's Gold Coast as we visit an archaeological dig that's rediscovering some of the city's material past. Lake Forest College students are getting their hands dirty at the site of a national historic landmark in the Gold Coast this summer. The students are part of an archaeological dig on the grounds of the Charnley-Persky House, which was designed by Louis Sullivan and Frank Lloyd Wright–at the time Sullivan's junior draftsman–in the 1890s. 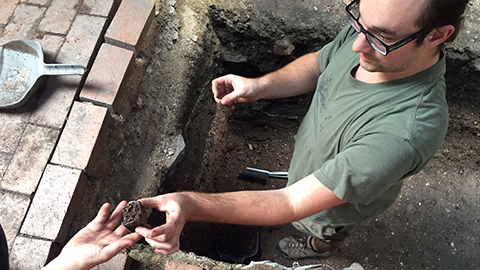 "Urban archaeology allows us to bring the past to light in ways that inform our present understandings of our great American cities," archaeology professor Rebecca Graff, who is leading the excavation, said in a press release issued by Lake Forest College and the Society of Architectural Historians, which is a partner in the project and headquartered at the house. "Chicago deserves to have its stories told before we lose them to construction and development," she said. Chicago Tonight visited the excavation site on Wednesday. Take a peek at what we discovered. The Society of Architectural Historians, founded at Harvard University, is celebrating its 75th anniversary on July 31 with free tours of the house, located at 1356 N. Astor St., from 4:00-7:00 pm. Reservations are not necessary. For questions, call 312-573-1365.